Our respondents’ views concerning the barriers to women’s workforce participation vary by industry and often reflect different industry cultures in addition to overarching economic and societal factors. Among overarching factors, the ones most visible through the data are the dual burden of caregiving and breadwinning, unconscious biases, traditional organizational practices in the workplace, a lack of role models, confidence, and the traditional divide between women and men in STEM education. Women have traditionally played a larger role in the private sphere as caregivers. Today, women still on average perform a much larger share of unpaid work across countries around the world—from routine housework to childcare, the value of this labour amounts to more than 20% of GDP across most OECD countries.27Many employers thus believe lack of work-life balance is a key deterrent to women’s participation at work. This factor thus appears to influence all industries. While in nearly all industries and geographies there has been a marked shift away from deliberate exclusion of women from the workplace, there continue to be cultural beliefs that lead to unconscious biases. This includes perceptions that successful, competent women are less nice; that strong performance by women is due to hard work rather than skills; and assumptions that women are less committed to their careers.28 In addition, especially in well-established, older organizations, workplace structures that were designed for a past era still, often unwittingly, favour men. Additionally, women’s historically low participation in the labour market means they have relatively fewer role models to look towards across all industries. Research from the US, UK and Germany suggests that women have a poor perception of senior roles and lack a clear line of sight as to how senior leadership positions might help them achieve their objectives, lacking role models who can reveal the trade-offs and benefits they bring.29 Women’s confidence and aspirations are seen as another barrier. Women are less likely to want a top job—citing the stress or pressure of the role as a deterrent. 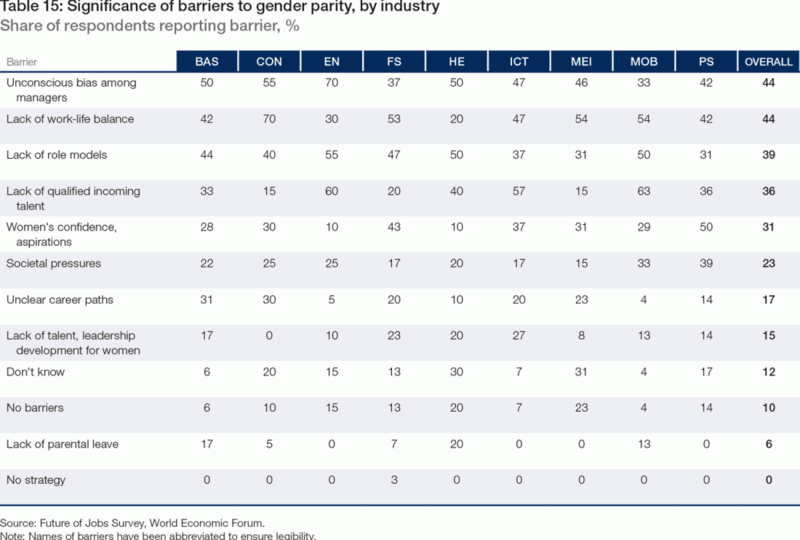 30 An often cited barrier is a lack of qualified incoming female talent in specific fields, especially in STEM education, where women currently make up only 32% graduates across the world.31 Finally, where each industry stands specifically is often affected by how recently an industry has improved its gender balance. Given that career choices are disproportionately affected by prior experience and bias, traditionally male dominated professions often find it difficult to attract women. Across all industries, unconscious bias among managers and lack of work-life balance are cited as the two top barriers to women’s workforce integration over the 2015–2020 period. The proportion of employers reporting these two factors as their main concern is equal—44% for each. Around 36% of respondents also voiced a concern about the availability of qualified talent, in particular employers in the Energy, Information and Communication Technology and Mobility industries. This is reflected in their low estimate of the current share of female junior staff, at 24%, 32% and 28%, respectively (Figure 17). The Information and Communication Technology industry sees this issue as their main barrier to a more gender balanced workforce. Basic and Infrastructure has a similarly low number of female junior staff, but there is less emphasis by respondents on incoming talent qualification, with unconscious bias by managers instead cited as the top concern. Financial Services & Investors and Professional Services place more emphasis on women’s own aspirations as a barrier, with Professional Services seeing it as the main limiting factor for promoting women’s talent. Lack of work-life balance is perceived as a particular barrier in the Consumer and Financial Services & Investors industries. By contrast, few sectors cited lack of parental leave as an issue (Table 15). 27 OECD, “Cooking and Caring, Building and Repairing: Unpaid Work around the World”, in Society at a Glance 2011: OECD Social Indicators, 2011. 28 McKinsey & Company, Women in the Workplace, 2015. 29 Centre for Talent Innovation, Women Want Five Things, 2014. 31 Source: UNESCO Institute for Statistics (UIS) database (September 2015); calculated from percentage of tertiary-level STEM graduates (female, male).